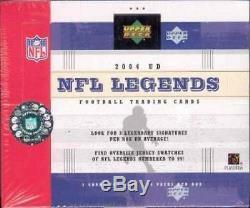 2004 Upper Deck Legends Football Hobby Case. 16 Box Factory Sealed Hobby Case. 3 LEGENDARY AUTOGRAPHS PER BOX. Configuration: 16 boxes per case. 3 Autograph cards of a legendary player. 2 Serial numbered rookie cards such as Ben Roethlisberger, Larry Fitzgerald or Eli Manning. CONTENT HIGHLIGHTS Oversize legendary jersey card numbered to 99 per case on average Double sided signature cards with 3 autographs on each side numbered to 5 Rookie Cards - numbered to 1025 Classic Legends - numbered to 1850 Future NFL Legends Jersey (1:24) Future NFL Legends Throwbacks (1:192) Legendary Jerseys - numbered to 99 NFL Legendary Signatures (1:8) Legendary Lines of Defense Triple Signature- numbered to 75 Link to the Past Dual Signature - numbered to 50 or less Link to the Future Dual Signature - numbered to 50 or less Immortal Inscriptions - numbered to 25 Legendary Heritage - numbered to 5 Parallels o Regular Card Gold - numbered to 25 Rookie Card Gold - numbered to 25 Classic Legends Gold - numbered to 25. The item "2004 Upper Deck Legends Football Factory Sealed 16 Box Hobby Case -48 Autographs" is in sale since Sunday, March 1, 2015. This item is in the category "Sports Mem, Cards & Fan Shop\Sports Trading Cards\Football Cards". The seller is "sportscardsetcpgh" and is located in McKees Rocks, Pennsylvania. This item can be shipped worldwide.